This entry was posted in Uncategorized and tagged bayer, Biotechnology, christian, corn, cotton, Farmer, farmer opinion of gmos, Farming, Genetically modified, gmo suicide, gmo tumors, GMOs, gmos are bad, gmos are evil, gmos are good, hybrids, meat, milk, monsanto, organic, pesticides, Peterson Farm Bros, Peterson Farm Brothers, poison, products, research, roundup, safety, safety of gmos, seeds, sickness, soybeans, spray, sustainability, syngenta, what do gmos look like, wheat by Greg Peterson. Bookmark the permalink. I grew up on a family farm in WA state. Enjoyed reading this! VERY informational! Thank you. Great work as usual. I’m glad American agriculture has you to advocate for them. One thing I’m not sure on is Monsanto being the largest. Done in a kind, factual way. Good presentation without a huge bias. I’ve written a few papers on this subject and have collected the same kind of info as you have. Very good presentation. Although I am ofr mthe use of any method to raise better crops and reduce costs I learned some things that I did not know before reading. If you ever wanted to know what a Kansas farmer believes about genetically modified organisms. Straight up, I was a anti gmo person. I say was because through research and great articles, such as this, I have changed my view. Thank you. Great job. God bless you guys, I hope to meet you someday. 27 year old dairy farmer, processor, direct delivery to the store. Thanks for the comment David! My goal is not to “convert” people to my opinion, but rather inform them of the facts and let them make their own decision. Thank you for seeking out the truth for yourself! I learned a great deal on your blog and videos. Thank you for taking the time to put this together. Great blog! Thank you for sharing the truth!! Thank you for publicizing this. As a farmer’s daughter and farmer’s wife, we need more input from the farmer’s point of view. I think the fool that coined the term “genetically modified” should have consulted with a marketing firm/agent to come up with a better, non-scary term than “genetically modified.” Keep up the good work guys! Thanks Greg. As a fellow farmer, it is great to know the truth about GMOs. Keep up the good work. Outstanding! Impressed with your insights. I have argued with my wife and others for quite awhile that GMO foods are perfectly safe. My wife has finally started to come around. Keep up the good work, looking forward to more videos! I cannot fault you guys for what you do. When a few farmers are expected to feed the entire world, I believe GMO’s/herbicides/pesticides is our only option. However, I believe there is an alternative, and that includes more family farms feeding themselves, working hard, proper crop rotation between several crops, and no concern for the dollar…just plain simple farming, the way it worked for centuries. Unfortunately I don’t see that happening; our society is too far gone. People don’t want to work and can you imagine telling a yuppie kid to put down his handheld and go feed the chickens?! Thanks guys for all the work you do in promoting farming as a viable career option. It’s a shame more youngsters don’t take note. God bless! Bryan, you mention “no concern for the dollar” as a part of “just plain simple farming,” but as a farmer’s daughter, a farmer’s wife and someone who works in the agriculture industry, I have to remind you that farming is how we support our livelihoods. Farming is our family business, and to not be concerned for the dollar is asking us to not be profitable, go bankrupt and quickly lose our farm. I grew up as the third generation on my dad’s farm in South Dakota, and my husband is the fifth generation to farm his family farm in Texas so I can guarantee you that we didn’t keep our farms in our family this long by not having a concern for the dollar. My husband’s great great grandfather settled his land in Texas over a century ago, and despite many struggles, he managed to turn a profit and keep his land. That’s how any business works, and farming is no different. Well said, Kaitlyn!! It seems that many think farmers shouldn’t make any money. Kaitlyn — I liked your response. It is discouraging that so many people associate profit with greed. They are two very different things. A well managed farm is a prosperous one, and vice versa. Good financial stewardship goes hand in hand with good resource stewardship. Show me a farm that is not economically viable or only marginally so, that lacks ability to prosper in the face of changing economic realities, and I will show you a farm that has issues with erosion, takes shortcuts on animal welfare, that lacks entrepreneurial energy, that holds less opportunity for new generations, and its operators have greater health issues, lack of motivation, and personal strife. It is also a farm that will not stay in the family long. Farming is certainly a business that supports a unique way of life and is a cultural anchor in a changing society, but it is a business nonetheless. I find it difficult to understand the perception that farming is somehow exempt from the laws of economics and that farmers have some moral duty to eschew innovation and cling to outdated ways of doing things. I think there is a romanticism that associates farming with subsistence agriculture, that farmers should have no need for or desire for education, health care, personal and household amenities and cultural experiences that other Americans take for granted. While most of us provide these things with salaries and benefits of our jobs, farmers must provide this for themselves through their business income and off farm employment on top of the demands of farming. We do expect farmers to practice good stewardship of the land and resources, but it is unfair and even paradoxal to confine the definition of good stewardship to romanticized and superficial understandings of farming. Technology and good resource stewardship can and do go hand-in-hand, and stagnate technology is as often as not a recipe for poor resource stewardship. I want farming to be profitable because it is in the interest of society, the environment, and the economic and social stability of rural communities that you do so. Now please take note I am not trying to piss off anyone I just feel i must say in your comment you said something about the alternative to GMO’s involves “working hard” now I do not know where you are from or what you do but all the farmer’s I know do work hard, now if you can come up with a way to work harder than everyday in your life from 4 am to midnight or more without going mad or losing your mind, then I am all ears. Another myth reflected in Bryan’s comment is that only “big farmers” plant GM crops. In 2013 GM crops were planted on over 36 million acres in 27 countries. The U.S. is the largest (40% of the total) but 90% of the farmers planting GM crops were resource poor and 56% of all GM plantings in 2013 were in the developing world (source is http://www.isaaa.org). I once heard Florence Wambugu, a Kenyan plant pathologist, make the point that if herbicide tolerant crops were available to African smallholders their children would be able to attend school instead of weeding. The “plain simple farms” I’ve been on in Africa and Asia all shared at least one thing in common, an aspiration to grow to the point that they could feed themselves and generate additional income from their labor. I made a mistake on the data included in my comment. GM crops were planted on over 300 million acres in 2013, not 36 million. 18 million farmers planted GM crops. Same source as in the original comment. Great job! Thanks for putting so much thought and research into your post and pulling it together in an understandable and referenced format. I’ll be referring people to it when they ask me about GMOs. Facts just don’t get as much media coverage as the sensational myths around GMO. Thank you for taking the time to write such an educational post. Thanks for wading in on a topic where controversy can keep a lot of the people who know it closely away. I can tell it took a long time to put it all together! I work for a company that sells GM seeds. I meet the farmers and understand, companies are here to serve the grower and help agriculture move forward in meeting growing demands. Thank you for advocating agriculture! Excellent blog! What I feel is one of your most important statements, “As you saw in the video, we eat our own crops, therefore we believe they are safe.” – One thing that gets lost in this entire debate is the fact that farmers are also consumers! We have to eat and feed our families just like everyone else. Greg, thank you striving to clarify a subject so often muddled. Through personal research and observation both in college while studying agronomy and now several years in the field of experience. This subject has and intrigued me to learn more and more. Please read the journal article that I have sent to you via Facebook message since there is not an upload portal here. Further discussion in a civil manner would be welcome. I thought your post was extremely well done and I felt like a gained knowledge and perspective on the subject. Good Job! Absolutely perfect!! In every way!! You hit it right on the head!! Thank you SO much for doing this. Sooooooooo much false information is out there. We need more people like you! I will be referencing this blog and the information found in it as well as your video for future projects of mine. 10000000 POINTS TO THE PETERSON FARM BROS!! Hi Greg – Thanks for this post. Can you elaborate on the ban of GM crops in the EU? I notice you did not include any references for this particular point making it seem more like an opinion than a fact. You’re right, I did not cite a source there, I will try to get that changed! Part of the reason I said that as an opinion was because my brothers and I visited Germany and talked to many different German farmers and subjects like GMOs often came up. They all said that the ban was based on fear, not fact. And several of them were jealous that we were able to use GM technology in America! Greg Peterson Farm Bros, As a dairy farmer we as a family have used GMO corn BT and RR but i found the cows had a drop in production i am now using a GMO conventional corn high in starch and sugar Milk production increase 12 to15 LBS and a decrease in displaced abomasums . What have your weight gains done? And herd Health? Excellent article!!! Well said in every aspect! We also grow GMO’s and eat them as well. Thank you for posting the facts! You and your family are truly role models for us and our children! Thanks again, and keep up the wonderful work!! Great links to independent studies on GMO Crops. I really just have a question, of you have time or resources to find the answer. But I am a farmer and do use GMO plants. But I have heard that corn is a man made plant. And if that is true, wouldn’t that make even organic corn a GMO? I am a 18 year old in south carolina. While I don’t agree with your beliefs on gmo food, I respect the fact that you stand behind your products. I personally try to be as organic as possible but thats pretty hard sometime. But personal tastes aside I am glad you have taken a stance on gmo. We have a difference of opinion’s but like you said we can and will continue to be friends. Thumbs up bro! But seriously feed as many as you can. Cause our farm is only 2 acres we can feed maybe thirty a year organicly. Well ill end by saying this I respect you for choosing farming as a living. Cause it is tough. You know what i mean. Ps God bless you bro in Christ. Thanks Paul! We can agree to disagree. Like I mentioned in the blog, I have absolutely no problem with anyone buying organic food as long as they know why they are buying it and they don’t demand non-organic food to be banned with no fact-based explanation! Thanks for the comment! I would disagree that there are many studies that “prove” the opposite of the conclusions I’ve drawn. For instance, one conclusion: “There has never been a death or sickness due to ingestion of GM Food.” Do you have studies that show death or sickness in humans after GMO consumption? I would love to see the “many studies” you are talking about. As far as I can tell, the vast majority of the scientific, peer-reviewed studies support GMO safety. GMOs themselves do not “add chemicals” into our bodies, the only difference between GMO and non-GMO is a single gene. They also do not mess with our ingestion. I’ve been eating GMOs for several decades and have never seen anything like that. The weakening of the honeybee population cannot be linked only to GMOs. There are hundreds of factors that could be contributing to that and there has been no conclusive evidence on specifics so far. Hopefully they can solve that problem, because honeybees are very important to farmers. I’ve seen a lot of Joel Salatin’s work and while he does have some good ideas and makes some good points, unless there are millions of new farmers lining up to farm this way, I don’t think his goals are going to happen. I would love to have a one-on-one conversation with him! If gmo and pesticides mess with bad bugs gut, don’t you think that it could mess with bees guts? While you are one hundred percent rigth about the many factors causing bee hive collapse, don’t you think you could do more to prevent it by not using pesticides or gmo? By going organic you could not only help bees but other people. I don’t know what the business market is like in Kansas but down here people are seeking out the organic over regular produce. In all I say go to God,pray, and listen. God bless. I would have liked to see you reply to the link from Rachel. Hybrid and GMO are not equivalent, you would not be able to breed in some of the changes that GMO’s do through cross-breeding ….ever. ….I don’t trust large corporations to have peoples best interest. for the most part they are all crony capitalists. I am not against GMO per se but I have little faith in the corporations and the peer reviewed. Global warming is a perfect example of peer reviewed fraud. And that is on an epic scale. in your reply to Rachel you mentioned that the difference is a single gene ..isn’t it a single gene that causes cancer in people. That argument can run both ways. I applaud your initiative but we often only see what we want. I grow my own vegetables and they are usually heirloom (I don’t have issues with hybrid ) and nothing I buy in a grocery store compares with regarding flavour. I do not insist on being or following certified organic standards as this too is full of holes and loaded with bullsh!t from the other extreme. I think science has advanced us tremendously but don’t trust any large corporation will be honest with so much money at stake. I would like to way in on this. For me, consuming a genetically modified plant is no problem (ie: F1 hybrid) however when a plant is modified to resist a chemical herbicide, that creates a different problem. When sprayed on the plant is there not a residue left on, or take up by the roots. And bees are not resistant to neonicotinoids. I understand the need to control weeds to get the best yield, but at what cost? Is it worth taking a chance with your health in consuming herbicide residue, to the environment, with the die off of bees. In our area Seattle has just become that largest city to band neonicotinoids. I am sorry, but with out the bees your farm, my farm, food production as we know it will not exist. GMO’s when modified to resist herbicides is not the path for sustainable farming. I’d like to add my perspective on your questions here. I think you have confused neonicotinoids with GMOs. The two are not related. Neonics are a seed treatment product to suppress insect feeding on young plants, which could be wheat, barley, corn or soybeans, to list a few. And as to whether they affect bee populations- the data is incredibly sparse on this. It is far too early to be imposing bans when we don’t yet know if Neonics even have a significant effect. Moreover, if we ban neonics, we will have to resort to older, considerably more toxic insecticides to control pests. The genetic changes genetic modification imposes are actually quite comparable to conventional breeding. Wheat is unrecognizable from its ancestors, and is in fact a different species altogether. Humans did that through conventional breeding; they altered the generic makeup of wheat (and other crops) to the point where it is a different plant entirely. Not that different from genetic modification; it just takes longer. Great post, Greg. I’m a farmer from Saskatchewan (Canada) and it’s great to see an informed discussion on this topic. People need to read the facts. I would like to get one thing straight, people think pesticides and GMO are the same thing, PESTICIDES ARE CHEMICALS, GMO’S ARE GROWN ORGANISMS/PLANTS. GMO’S REDUCE THE AMOUNTS OF CHEMICALS APPLIED. People use those terms synonymously and it annoys the heck out of me to no end. Let’s think about how many other bad things we have been adding to this world: Fuel exhaust, cigarette smoke, aerosol, etc. The reason the bees are disappearing is because of all of the pesticide residues. From what Greg was saying, GMO’s are allowing us to apply fewer pesticides (and herbicides) because of a natural gene found somewhere else that is put into the plant to give it a resistance. It is one gene that is naturally found elsewhere, it is not being created in a lab somewhere. The largest misuse of chemicals comes from people spraying their own lawns to get rid of the one dandelion in their front yard to try to keep it perfectly green. All farmers are required to be licensed and certified to be able to buy chemical applications (at least in my state, CT), and it obviously costs a lot of money so we don’t spray things just because we want to for aesthetic reasons. Many people go to home depot and probably do not read the application instructions, overdose, do not dilute enough, and therefore, use way too much resulting in extra residues that the bees are picking up. Here is a link to one of many bee studies, with CCD being linked to chemicals in the spray. GMO farmers are using less spray than ever… I am for GMO’s, my farm uses them, my animals, my family and myself are quite healthy and I have yet to have a problem with GMO’s. So GMO isn’t a safe technology, but it has been studied by THOUSANDS …. Maybe more than 10,000 scinentists wrote something about this …. And what do we got ? Nothing more than “You never know” …. So if you’re not sure about GMO can maybe do, or maybe not, because human changed one or two genes in it …. Think about the all natural plante reproduction : millions of gene mixed !!!! And there is no study about every genetical changes it gives …. I notice that you ignored my question. Although you may not have any health problems yet, what if you do in the future, as many people have? Infertility, hormone related cancers, allergies, asthma and many more can be linked to GMO consumption. Once you marry and have children (if you’re able, due to high infertility these days), you may want better for your children. Just because it’s already a fallen world, does not mean that we shouldn’t give our children the best in health and prosperity. We have a son with severe allergies (food and environmental). He is sick much of the time, so eliminating toxins (to give his little body the most nutrients and he least amount of stresses) of all sorts are high on the priority list in our life. Maybe someday you’ll be in the same place. Getting food and life back to the way God intended will bring us the most health, not trying to play God and “improve” on His gifts through GMOs. We will not be blessed in the long term, even if the short term benefits may look like it’s a good thing. Also, you must also check who is funding the studies you are citing. Most often the results are able to be skewed the way that the finders desire (in any area of debate). If you download and read this book I’m posting, maybe you’ll see where some of us are coming from. It also has the data on GMO damage you asked for. Funders* not finders in the last paragraph. People funding! I find it interesting that the thousands of farm families who are growing GMOs (and eating their own crops) are some of the healthiest people in the country. How do we explain that? We don’t have any sort of allergies in our family and until there is a clear correlation provided that shows how families who eat GMOs have more health issues and families that don’t have less, I will have trouble believing the studies you have posted. The thing to remember is that GMOs are helping farmers, have the potential to solve hunger crises, and reduce the amount chemical usage. Unless the proven concerns outweigh the proven benefits, it makes sense to grow GMOs. In the last few months I have been hearing about GMO’s causing a loss in reproductive rates in livestock and that several corporations are now looking to use Non GMO corn and beans as their main protein source in feed for their breeding facilities. If true that livestock producers feel that it is causing reproduction issues in livestock how long before it becomes a Human health issue. Very little supportive data to support this of yet but a large increase of request for Non GMO grain. Good question. The Governments would be happy if it caused reproductive problems in Humans, because they are worried about to many humans on this planet. Like they keep pushing these vaccinations that has mercury in it. To many kids end up with ADHD and other things that they didn’t have before the vaccinations. Check and see what margarine was originally going to be used for. Hey guys! We’re big fans of your work (who isn’t?) Wanted to thank you for taking the time to write this post. Talking about GMOs isn’t always easy, but it is always important. We’re glad to hear your voice in this conversation! Let us know if there’s anything we can do to help support the work you’re doing. Thanks for this summary of the GMO story. I do not known if there is more than two mistakes. I am French, I’m growing corn, and I can not plant GMO seeds because of the fears that environnementalim organizations spread other the whole non-farming population. Most of those preachers are not scientists, are not farming at all, there biological knowledge is close to high school level, but they are shoutting enought to get on TV …. and they made peoples trust them anyway. You’re right when you’re saying we refuse to plant GMO, but 90% of our cattle is GM-feed, RR-Soy feed ! Because our ISO-soybean are now so expansive to produce that we can not sell it for cattle feed ! 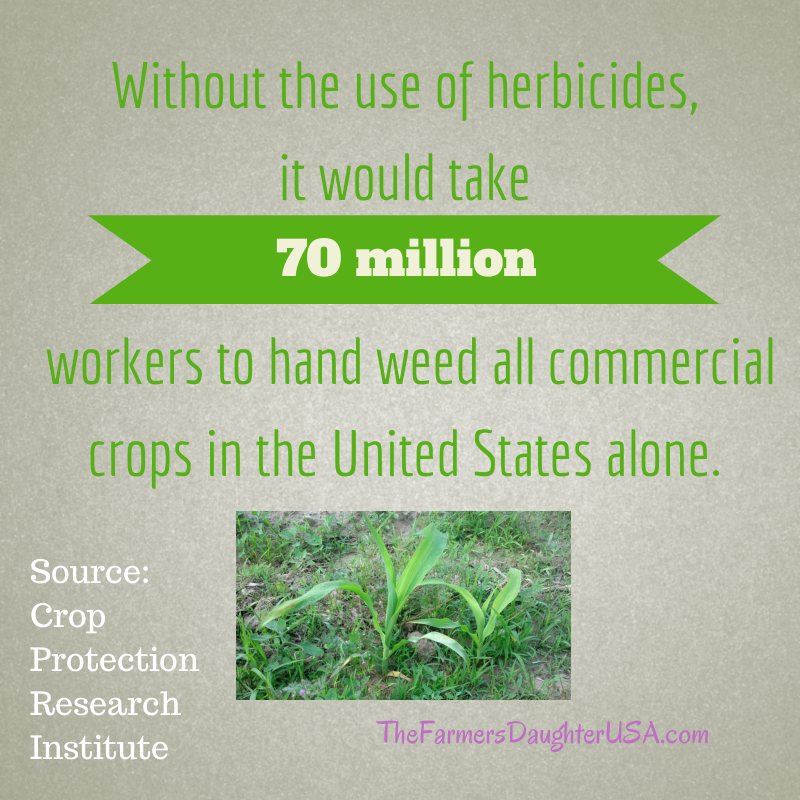 Only one more point : Herbicide consumption. Yes Glyphosat consumption is rising, while GMO RR acerage is growing. But do you got an idea about the toxicity of the chemicals I do have to spray instead of Round-up ? We do have to spray herbicides 3 times a year on corn, and there is 2 or 3 differents types of chemicals in the tank. Ok, so where 1L of glyphosat (Roundup) cost me 3€. 1L of sulfonylurea can cost me 90€. Who is helping most the “chemical industry business” ???? I hope I did not disturb too much peoples, thanks to argue, as this blog is well doing it, better than I could, you got to remenber that I’am french, so sorry if my English is not perfect, but this is the best I can produce. Thanks for the comment! I agree with everything you said. I did not realize most of the livestock there is fed GM feed. That, along with how you said you agree that the ban of GM crop production in Europe was due to fear and not to fact, supports several of my points in the blog. This is almost right, there is a scientist in France who tried to know how many scientific papers was written about GMO in the world about 2010. The result is : 26,184 …. This was the world wide GMO scientific library in 2010. Exactly. 2,000 is probably a very conservative estimate. There is simply a ridiculous amount of study that has gone into GMOs. Thank you for your informative piece. I was commenting tonight that more folks need to hear from the farmers that are doing the work to put food on our tables and the tables of the world. The seed companies can’t advocate for GMOs. It is up to the farmers and educated consumers to advocate for them and to help dispel the misinformation about them. I am a 63 yr young consumer from Dallas, Tx. I have watched while our farmers (and farmers in other countries) have increased the selection of available food and at the same time, kept the price affordable. Appreciate that! Thanks for the comment! Congrats on the work you have done here! I am thoroughly impressed here by your work! I have done a little traveling outside of the Midwest, and I have talked to many outside of our region who are strongly opposed to GMOs. I ask why and their response is usually one of the misconceptions about tumors, animals not eating GMOs, chemicals, etc., like you mentioned. My overall goal like you is not to convert people, but rather inform people and let them make their own decision based on the facts. Prior to reading your article, I used many of the same viewpoints as you, seeing as I too come from a family farm and use GM crops and consume GM products on a daily basis. One thought to your point about stewardship agreements with companies (I have no argument on, just an addition) and why farmers cannot keep seeds, is (to my working knowledge) because of the heterosity of the plants. This is a somewhat technical concept, but when explained in terms of people or animals, I have found it helps shed additional light as to why farmers are not allowed to keep seeds. Again that is one person’s opinion and method to describing a particular misconception. I look forward to hearing and reading more about your interactions and insights into agriculture and farming! I will be sure to pass along this article to those who I meet in the future, who are willing to listen not only about GMOs but agriculture as well! Best of luck in your future endeavors! I am strongly anti GMO but I respect your right to believe what you do. You don’t have a problem eating it and we have all eaten it for years without knowing it. But that does not mean it is safe in the long term. I also have every right to have my food labeled so I know what I want to eat and what I want to avoid. I think there is a lot more to the story that we all may never know. A truly independent study is difficult to find. Before I believe anything, I try to find the funding for the study because that will affect the results. Thanks for the comment Jan! Just curious, what exactly is considered long term for you? As of today, we have been consuming GM Food for 20 years and have consumed 1 trillion meals. Would long term be considered 50 years? 5 trillion meals? Is there really much that can change after so many years? Why don’t people wait 50 years to use smart phones? They seem to have a lot of risks to using them. Maybe we should all stop using smart phones until the long term (50 years) studies have been done. Just some food for thought! A lot has changed in 20 years of food. Corn is added into lot more product then 20 years ago. Cancer is on the rise. 1 out of 4 people. While there may not be studies linking GMO foods to cancer, that doesn’t mean there isn’t a link. Look how many years it took Tobacco to be link to cancer. I’m a small permiculture farmer. While I agree there is lots of stupid fears on GMO, a simple labeling of GE foods is all I ask. That way I can make the choice based on the knowledge I believe. Labeling makes it easy for everyone. The farmer who feel GMO Corn will help feed the world can stand behind their product. People like me who sometimes have to eat outside my garden can choice to avoid GE foods. Either way it’s a win win for everyone! Hi Greg. Excellent article. As an animal scientist for over 30 years (in the USA, Ireland, Holland, Canada), I agree with you fully. I practice what I preach in restaurants and refuse to eat anything that is labelled “GMO-free or organic or natural”. Re the comment on cancer below – I don’t believe that the rates of cancer are actually increasing (but the rate of diagnosis may be increasing because we have much better diagnostic tools now and every illness has to be called something nowadays) BUT, if they are, I believe that it is due to the following: (a) society is living longer and longer (despite all the so-called nasty things we scientists have developed!) and, if you live long enough, the body wears out and cancer occurs; (b) people don’t protect their skin enough (skin cancer); (c) our lifestyle (eating unhealthy junk food – obesity, air pollution (carbon), illegal drugs/cigarettes, etc.). Re organic tasting better comment: in my opinion, organic food production is simply a marketing tactic – there is not a shred of evidence that organic food is better than conventional food (at least in the West). Why some people might think organic food tastes better is because it tends to be locally produced and, therefore, fresh. Everything tastes better fresh! I am totally in favour of buying locally-produced and seasonally-produced food (fresh, minimize transport pollution) but forget the “organic” palaver. Ah the ever popular plea for labeling, and it’s understandable. But does anyone really know what the labeling would cost? It would affect the entire production of food, from the farm to transportation to storage to the store. And who would pay for that? The consumer. The affordable price of food is something that is taken for granted. I find the point about labeling costs to be FALSE and irresponsible. Labeling of GE fude is currently required in many other countries. This labeling is already being done by the same food producers that send food to the USA, many are USA companies. No cost increase or difference. As the Blog suggests, we do have the right to know what the food we eat contains and where it comes from. Without labeling there is no real way to track the results of consuming anything. There are many health concerns in the US that have come to be over the past 20 years, the time that GE fude had been in our food supply. Without labeling it makes it easy to exclude GE fude from possible cause. Companies relabel all the time. GF labeling, New and Improved, when a products get bought out by another company. Labels have flashly colourful labeling. “All Natural”; Organic; Kosher; I’m sorry but you’re “cost to label” is just LAME. Nutrition Labeling and Education Act of 1990 didn’t add a huge cost to the food prices! Look at the historical data. GE/GMO labeling is the least we can do. If you aren’t afraid, or proud of what your product is made of it should be on the label. Finally there is this (link below) a proposed label change for 2014-2015. Why not just add GE/GMO at the same time. It would ‘SAVE’ money. http://www.fda.gov/Food/GuidanceRegulation/GuidanceDocumentsRegulatoryInformation/LabelingNutrition/ucm387533.htm. Using Europe as an example of the success of food labeling is a bridge too far for me. For example, in the UK, poultry farms are required to stamp every single egg! As an aside, the European Union has been a source of many other ridiculous food regulations. The EU recently banned cinnamon and olive oil served in bowls at restaurants. It also banned the sale of home canned goods being sold at churches and charities, etc.. The regulations for small restaurants have become very complex and unnavigable. I hope this gives some counterbalance to the idea that following the European food regulation models would be desirable. We also have the ozone layer depleting which will relate to cancer. We have more technology which emits radiation (phones, tv’s, computers) and is directly correlated to cancer. Lots of PROCESSED food contains added preservatives and chemicals (that is added after the food is harvested, therefore having nothing to do with the GMO aspect of the food). People are getting less exercise and obesity rates are sky high compared to what they used to be. There are a lot of other things changing besides GMO, I think our focus needs to be more on those aspects of life. Great blog, two interesting facts I have learned while reading the national organic standards; 1. organic producers can use pesticides, hormones and antibiotics including Bt insecticides. 2. Processed organic foods can contain up to 5% GMO ingredients. God speed in your search for truth and open minds. => Even Bee-keepers are using it, in an organic way or not they can spray Bt insecticides directly on hives. Thank you for writing this informative post. We have a very small farm in comparison and focus on heirloom seeds. As and heirloom farmer, I am very concerned about the so called “Suicide” seeds. Seed saving has been an integral part of agriculture since the beginning of time. These seeds give entire control to seed companies. It also could be very damaging to developing nations and farmers that lack the funds to buy new seeds every year. Thank you for taking time to do research on this topic. If anyone else would like to weigh in on this issue feel free! Norman Borlaug, the father of the “Green Revolution,” was very interested in GMO developments and felt that they were a natural extention of his own work in breeding new, high yield crops. His work saved millions of lives and his crops allowed countries such as Mexico and India to become net exporters of wheat and rice, rather than importers. He was truly a great man. I am not a farmer, but I loved reading his biography. He grew up on a farm around the time that new varieties of crops were being bred and sold, in the 1920’s. These seeds had to be bought each year, which some farmers really objected to. But Norman Borlaug’s uncle decided to plant a plot of the newer variety to see if it was actually worth the while to buy the seed yearly. He did his test plot and decided it was well worth the price of buying the seed each year. It is customary for people who develop a wonderful rose or wheat plant to make a profit from that development. (That is why you agree not to take a cutting from a miniature rose.) It has always been that way. The farmer is the one who determines if the returns are worth the investment. One more interesting fact is that plants can be genetically altered by exposing the seeds to certain frequencies of em radiation. This causes mutations and some of them are desirable. It is allowable to do this in “organic” plant propagation. These are mutations caused by radiation, and is much more trial-and-error, but new cultivars can be created this way. Very good, informative post, Greg. I hope your information reaches out to people that are on the fence. Don’t let the negativity get you down, there are activists that attack you even when presenting the truth and facts in a respectful manner. I had an activist try to get me fired from my nursing job from writing a post on Arctic Apples. They no know bounds and are ruthless. Well done. Gentlemen: This is a difficult topic to navigate but I am so pleased that you dove in! Your perspective – your voice as farmers, consumers – matters in all this. Congrats on moving the conversation forward! Well done! My name is Melissa and I am a 4th generation dairy farmer in Oregon. We have been organic for 10 years, but we were conventional for 80 years prior to that. I will be honest, I am not a fan of every type of GMO, but I see where they can have their place. I believe consumers should have options (and I hope they make their choices with truthful knowledge) and if they choose to not have GM products because of their personal beliefs/values then that is ok too. That is what I believe the consumer has a right to, above and beyond that though I whole heartedly support what you do. Farmers should have the right to pick their given tools without hate and prejudice from consumers that are giving no alternative. Farmers work hard no matter what side of the fence they are on to be good stewards of the land and take care of their animals. Farmers need to learn to be respectful of each other as well. We each have our own methods and while they may differ we are all still farmers trying to bring healthy, nutritious products to the world. I’m glad you are taking a respectful role in agriculture. We so often have hatefulness thrown at us these days. My daughters love your videos! When they ask me what it means for us to be organic and others to be conventional I explain that we are all farmers we just use different methods. Thanks for being amazing advocates for the ag industry and good role models for young farmers. Thank you for that thoughtful comment Melissa! I agree with everything you said. As long as consumers are making decisions based on truth they have every right to purchase freely! Raised on Virginia hillside farm – worked for Monsanto for 46 years – eat GMO food every day – organic food way overrated and overpriced – retired & working on my 74th birthday without any real digestive or medical problems. Thanks, Greg — you guys are awesome….. If you just watched any of the documentaries about monsanto and it’s practices, you would know that Monsanto has a very nasty track record. Why should i trust Monsanto nowadays, knowing that they have been lying about the safety of their products and environmental pollution since it was founded? Many people are still suffering from their past (and present) products daily. That you have not encountered problems in your carreer within Monsanto doesn’t mean they didn’t exist.